If there is one thing that would really excite the K-pop fans like me, it is the SM Supermalls’ celebration of Korean Day this October 1-7, 2013. Hype your Korean obsession as selected SM Supermalls celebrate Korean day! Enjoy performances from local K-Pop groups doing song and dance covers from your favoriteKorean K-Pop artists happening at selected SM Supermalls. Celebrate Korean Day at SM Supermalls with your K-pop idol. Feel like you’re with your idol at the Korean Star Gallery. In partnership with local music labels and selected stores, life size cut outs of famous Korean Celebrities will be present at the venue ready for photo ops. Awide selection of your favorite Korean delights will be featured at the Korean Food Bazaarin partnership with SM Supermarket. It’s a one-stop shop to complete the grocery list and fill up any pantry and fridge with Korean goodies. Korean music has taken Asia and the world by storm. Watch out for the biggest K-pop party in town as SM Supermalls, in partnership with Astro Plus, SM Store Record Bar, and Odyssey will be having a Korean Music Bazaar featuring music from the K-pop hits that topped music charts. Get the signature Korean look withtheir luminous skin, preppy hair and natural make up. Discover the secrets of Korean aesthetic at the Korean Beauty Bazaar where selected SM Stores will walk you through the gallery of the best Korean skin care, makeup and hair styling products. 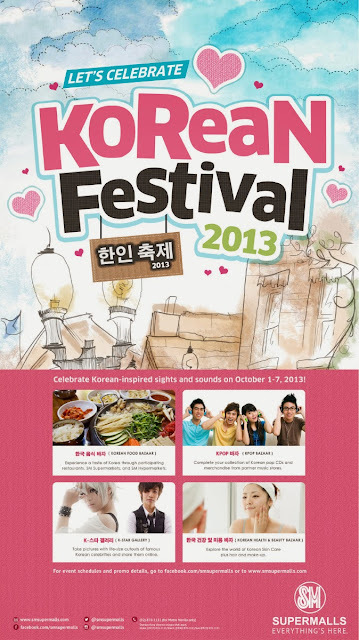 Head to SM Baguio, SM Tarlac, SM Clark, SMol, SM Baliwag, SM City Fairview, SM Southmall, SM Dasmarinas, SM Cebu, SM Iloilo, SM Cagayan De Oro, SM Lanang Premier and SM Gen San and join the Celebration of Korean Festival this October 1-7, 2013. To know when these events are happening in the SM mall nearest you, check-out www.smsupermalls.com or facebook.com/smsupermalls and follow us on Twitter and Instagram (@smsupermalls) to join in the fun and for more updates. I will go check this out! I love Korean drama and I love their make-up, too!